Mallo Cups are milk chocolate cups with a whipped creamy center and a sprinkle of coconut. There are 2 cups per package in the standard size. Yes, they still come with the coupons and you can still redeem them (see below). In Altoona, PA, is a confectionery company, Boyer Brothers, Inc. that manufacturers cups - actually cup candies. Cup candies consist of various soft centers and coatings molded directly into crinkled glassine paper cups. Founded in 1936, Boyer Brothers specializes in producing candy bar items that come in cup form. One of their best selling is the Mallo Cup, milk chocolate coating containing coconut, with a whipped marshmallow cream center. Another cup, Fluffernutter, is a combination of marshmallow and peanut butter covered with milk chocolate. Peanut Butter Cup has a peanut-butter center covered with milk chocolate. S'Mores combine graham cracker, marshmallow, and chocolate. Other Boyer cup products are Bunch o' Nuts, Milk 'n Cookies, Smoothie and Minty Mallo. Smoothie has a center of peanut butter and is coated with butterscotch. Minty Mallo has mint-flavored marshmallow cream center covered with dark chocolate. 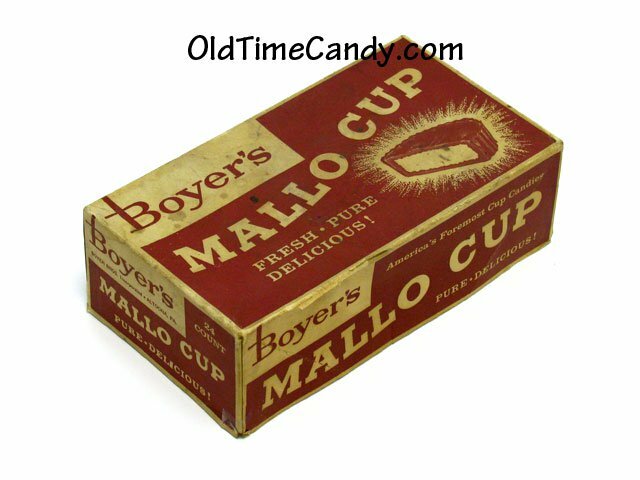 Today only Mallo Cups, Smoothies and Peanut Butter cups are still made by the Boyer Brothers company. Boyer is still redeeming the coupons. You can get a catalog and order form at their website. Back in my hometown of Pittsburgh, PA, our corner grocery had a nice variety of candy bars and bags. The grocer charged a nickel each but sold us 6 for a quarter. I remember biting into a Mallo Cup and all the marshmallowy, creamy, goodness with a bit of coconut in there, surrounded by milk chocolate. Of course, Mallo Cups had "money" inside printed on cardboard. From a penny to a dollar. Once you saved $10, you could send away for a whole CARTON of Mallo Cups! It was a kids' wildest dream (and a parent's worst nightmare - tooth decay). It took so long to save the coins, but one particular summer, I started saving in earnest. Some of my friends couldn't be bothered, so I asked for their money. Finally, I was less than $3.00 from the total and had 15 cents and went to the store with a friend. He said, "Let me pick the ones out." "OK", I said. I watched as he pointed out 3 Mallo cups from the stack of candy on the shelf. We had just walked out the door and I opened the first one, and Wow! It was a Mallo Cup Dollar bill!! I gave him one to say thanks, and there was 50 cents! I was going to save the last cup for later, but tore into it and I couldn't believe my eyes...It was ANOTHER Mallo Cup $1.00 bill! I made it! The next day, with papers covered with taped on Mallo coins and bills, I put it into an envelope, and a few stamps and handed it to our mailman. Now the long wait began!